For more than 40 years, Kripalu has been teaching skills for optimal living through education for the whole person: body, mind, heart, and spirit. It is the largest and most established retreat center for yoga, health, and holistic living in North America. Programs at Kripalu are led by many of the world’s most accomplished teachers in yoga, self-discovery, and holistic health and are designed to provide people with tools they can apply in their daily lives. Program topics include wellness, Ayurveda, nutrition, fitness, personal growth, relationships, meditation, spiritual practice, professional training, and much more. Yoga programs are offered for people at all levels, feature all yoga traditions and styles, and include therapeutic yoga, yogic anatomy, and trainings for teachers. Many Kripalu programs offer continuing education credits for professionals in fields such as social work, counseling, nursing, and massage and bodywork. Experience Kripalu’s R&R Retreat, a customized stay that includes a flexible schedule of classes, outdoor activities, and personal time. Take a program on a topic of interest—including yoga, health and wellness, spiritual practice, personal growth, and creativity. Attend a Kripalu Schools residential training. Our nonprofit organization is dedicated to creating an awakened, compassionate, and connected world, and our educational offerings are designed to help people realize their full potential as they learn to apply the principles of yoga on and off the mat. For its first 30 years, Kripalu was an ashram, where up to 350 residents and a small number of guests practiced all aspects of the yogic lifestyle under the guidance of an Indian guru. Kripalu came of age in 1994 when a painful scandal compelled the ashram community to move beyond its traditional guru/disciple paradigm. 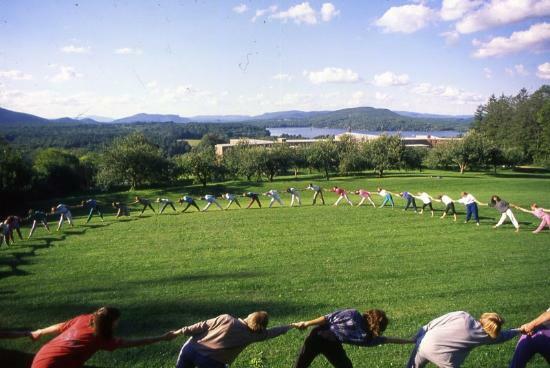 Restructuring itself as a retreat center, Kripalu broadened its program offerings and transformed into the vibrant nonprofit educational organization it is today. In many ways, Kripalu’s history parallels the evolution of yoga in America, which has progressed from a reliance on Eastern teachers to the leadership of masterful Western teachers and integration of contemporary discoveries in medicine, psychology, and science. While its program curriculum has broadened, Kripalu remains dedicated to the rigorous inquiry into the core values that have always been at the heart of its mission: Integrity. Presence. Inquiry. Service. Compassion. Practice. These values have become deeply etched in the Kripalu culture and are shared by our faculty, invited presenters, and guests. Kripalu is now a leader in mind-body health, and is a dynamic organization that continues to grow and evolve. We invite you to explore everything Kripalu has to offer, visit often, join us online, join our donor community, and find ways to make Kripalu’s mission of empowering people and communities through the transformative wisdom and practice of yoga your own. As the largest center for yoga, health, transformational learning, and professional training in North America, we host nearly 40,000 guests a year. We award $500,000 annually through our Scholarship Programs so that those with financial need may experience Kripalu. Kripalu’s green Annex building uses half the energy consumed by a conventional building of the same size, and its design elements minimize its carbon footprint. Kripalu has trained more than 8,000 yoga teachers and Ayurvedic Health Counselors, who share a wealth of knowledge and techniques with their communities. Kripalu’s international network of more than 2,000 yoga teachers brings the benefits of yoga to thousands of students every week, including inner-city children, the elderly, and cancer survivors. We reach out to more and more people every day as we develop programs in medical, therapeutic, and academic settings; partner with institutions of higher learning; and embrace new technologies for digital and blended learning. Groundbreaking research conducted by the Kripalu Institute for Extraordinary Living, in collaboration with Harvard University scientists, is tracking the effects of yoga on war veterans and people with post-traumatic stress disorder.